Q: Why did you decide to contest the upcoming election? A: We have formed a party with the intention of contesting any future election. Presently we are having discussions about whether or not we should contest the upcoming election. If contesting, we also have to think what districts and areas we need to contest from. We have still not reached a final decision. We cannot take a final decision due to the unstable political situation in the country. We are still observing the behaviour and reaction of the main parties. We will be able to take a decision only after studying this situation further. Q: Have you registered your party? A: Yes. What we got was an already registered party. Nath Amarakoon had already registered a party as ‘Eksath Sinhayale Maha Sabhawa’. It was this party that we took and changed the name to Bodu Jana Peramuna. As far as the legal aspects are concerned, we have no restrictions to contest at the upcoming election. We believe the political system in this country needs to be changed. We cannot let rogues, drug dealers and thugs rule this country. 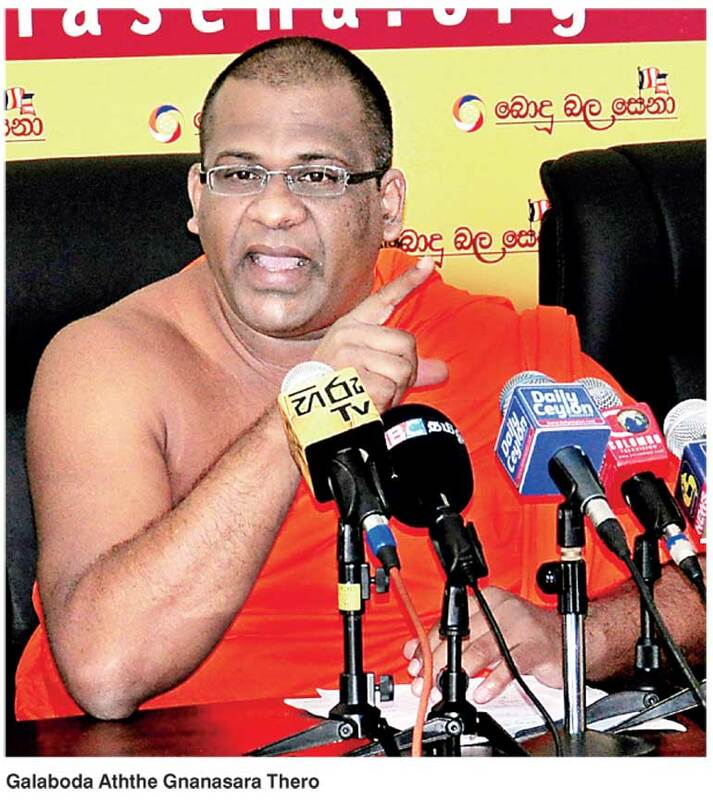 We need politicians who have a clear vision for the country"
Q: There are a number of Buddhist parties in the country. Without supporting such a party, why did you decide to form a new party? A: There may be various so-called Buddhist parties, but we have felt that none of these parties are there to safeguard the Buddhists in the country. We decided to enter politics because we felt that these parties are not taking any action but only worsening the situation. We need to strengthen the Sinhalese, who are getting weaker by the day. All the main political parties are fighting with each other merely to get into power and remain in power. They don’t realise that by doing so they are only damaging the Sinhalese. We want to challenge all leaders and tell them we are here for a good cause. That is to protect the Sinhalese of this country. We also want to gather all the parties and get them to work according to a national agenda. If not, there won’t be a country called Sri Lanka in future. Q: Are you saying that parties such as the Jathika Hela Urumaya have failed to fulfil the pledges they have made to the people? A: It is not about JHU or any other party. What I am saying is that all political parties in the country have failed to fulfil the pledges they have made to the people. For example, although we have being shouting against conversions, we still have not been able to pass the act preventing this. They promise the people one thing and then do something totally different to what they have promised. I am not pointing my finger at a one particular party. What I am saying is all parties are like this. Q: In the beginning you claimed the BBS had no intention of getting into politics. Why did you change your stance? A: We never said that. What we said was that the BBS was an organisation fighting for national revival. But we always reiterated the fact that people who follow us in this cause need to be at the decision-making level such as in Parliament and provincial councils, etc. We believe the political system in this country needs to be changed. We cannot let rogues, drug dealers and thugs rule this country. We need politicians who have a clear vision for the country. What we have today is politicians who try to change the country for their own betterment. The BBS wants to become a decision-making political force in the country. Within the next 10 years we will ensure this goal will be fulfilled. Q: Who will contest from your party? A: We have not finalised those details. Within the next four to five days we will be able to reach a final decision. Q: Is it true that former Defence Secretary Gotabaya Rajapaksa is to contest the upcoming election from the Bodu Jana Peramuna? A: No, that is an absolute lie. There is no truth in that and we have not discussed anything like that. Q: Will you support Mahinda Rajapaksa at the upcoming election? A: No, we will not support anyone. Q: You backed him during the presidential election. Why aren’t you supporting him now? A: At that time we knew this would happen to the country. Just like we predicted the country is now in danger. We asked the people to vote for Mahinda Rajapaksa so that our country would be safe. However, just because we supported him last time that does not mean he has our backing this time too. People who would want to vote for Rajapaksa have already taken their decision. They don’t want us to campaign for their leader. What I feel is all the leaders only think about their benefit. They don’t love the country. This is why we should change this system. This is why we should get all the parties to work together on a common agenda. Q: If invited, will you support a coalition government? A: We will have to take a decision at that time. We will have to look into the situation, especially the policies, and take a decision. Q: Do you also think Mahinda Rajapaksa lost the presidential election because of the BBS? A: This is what is called mudslinging. Now we know who was in the forefront to defeat the former President. Ranil Wickremesinghe says the conspiracy initiated in the United States. Whether we contest the election or not, people need to make the correct decision when casting their vote. We need genuine and good people in Parliament. We need professionals and academics to be at the decision-making level. People should think not twice but many times when casting their ballot for drug dealers, murderers and wrongdoers. Q: The BBS was active and vocal during the last regime. What have you been maintaining a low profile over the last five months? A: No, there is no truth in that. In fact from the day this new Government came into power we have been doing more work. The only problem is that we no longer get the publicity we used to get. This so called ‘yahapalanaya’ has cut the wings of the media.